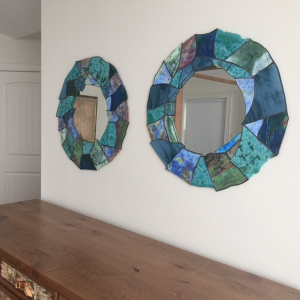 Last spring we delivered a pair of custom mirrors to a client. The project began with an inquiry via CustomMade, a platform that connects people and their ideas with creative makers. 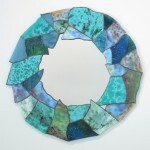 This inquiry was for a large mirror made in the style of our irregular border mirrors. Jay creates those mirrors with hand-rolled opalescent glass, choosing some pieces for their irregular, “natural,” uncut edges. One of us selects three or more complementary glass sheets and then Jay intuitively lays out the border of the mirror. 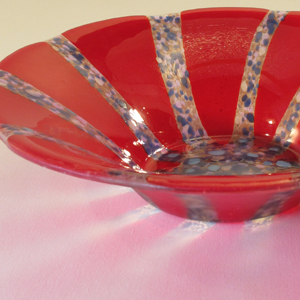 The multi-hued artisan-made glass has streaks and swirls like fudge-ripple ice cream, in color rather than black-and-white. Most colors show up well against a wall and need no back-lighting but rather stand out by reflecting light in the room. After corresponding with the potential customer about size possibilities and deciding upon two round shapes instead of a large rectangle, we sent her a proposal that she accepted. 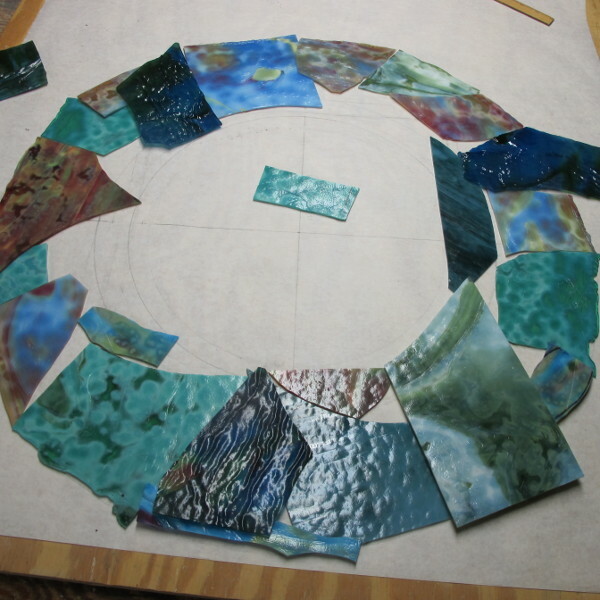 To begin we worked out glass colors. She requested “sort of water colors and movement” and later added, “I’m thinking many shades of blue and greens with maybe just a touch of earthy browns and sunlight yellow.” She named her preferences from among a dozen or so possible sheets of glass we showed her via photographs, and we selected six that would work well together in the mirrors. Five of the sheets had been made in southwestern Pennsylvania and the sixth came from Portland, Oregon. In the meantime Jay planned the mirror layout. He diagrammed the size of the doughnut-shaped opalescent glass border and the position of zinc channel to hold the mirror glass behind it. Although he would assemble both borders fairly spontaneously, he had to calculate how to build in strength and securely connect the border and zinc channel. As soon as we knew which sheets of glass to use, Jay began cutting glass for the first mirror. He watched for areas of glass with interesting streaks and swirls of color, as well as undulating edges that he could leave uncut. Some edges resembled the irregular curve of the leading edge of water lapping a sandy shore. 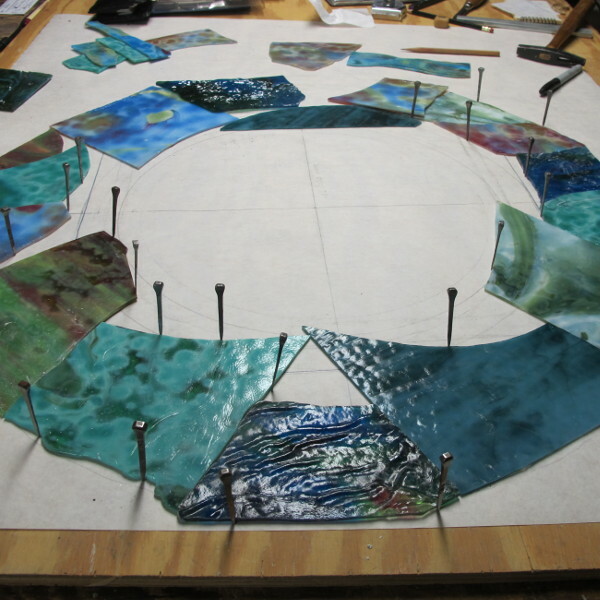 Jay moved glass around over the diagram, continually re-positioning as he sought out pleasing color juxtapositions and contiguous outer edges. 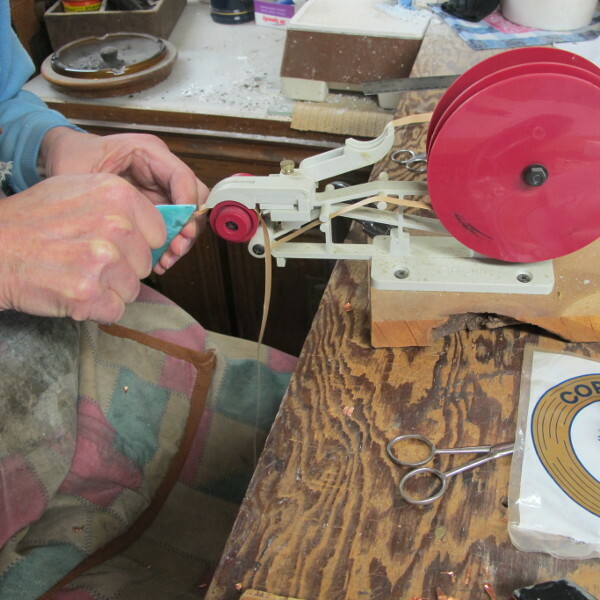 He cut pieces large enough to trim down as he determined final positions. Some pieces moved repeatedly before settling. 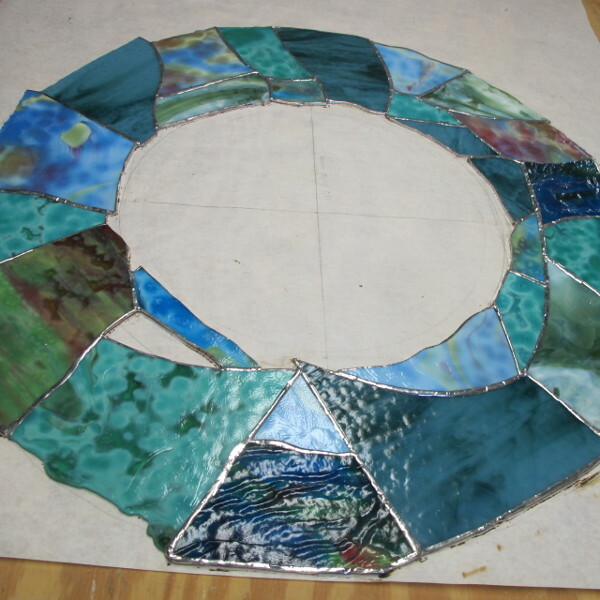 Gradually the border took shape, a montage of mostly blues and greens. After Jay had cut the last piece of opalescent glass, he had them all fitted together and held in place with horseshoe nails. He placed the flat-sided nails next to the glass, not through the glass, and tapped them into the wooden worktable to prevent the glass from moving. 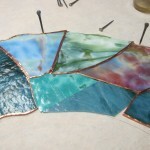 The next step was to wrap every cut edge of glass with narrow copper foil. Jay used pre-cut foil with a sticky backing: 1/4″ wide foil where cut edges abutted one another and 3/8″ foil on outside edges. He did not apply foil to the “natural” (uncut) edges. A foil dispenser facilitated the work. 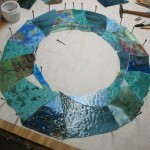 One at a time he removed glass pieces from the assemblage on the work table, wrapped them with copper foil, and replaced them into the border. 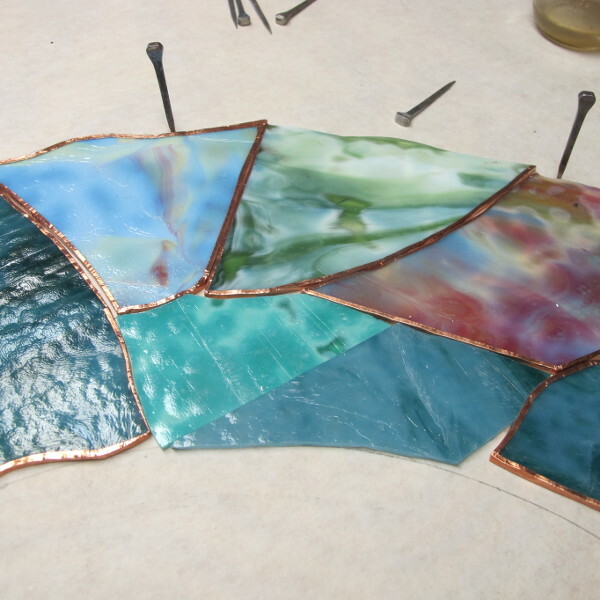 When all the glass pieces were wrapped and refitted into the mirror border, Jay applied 60/40 (60% tin/40% lead) solid core solder to all the exposed copper foil. First he “tinned” the foil by flowing a thin layer of solder over the surface. That thin solder coating was enough to hold the pieces together so Jay could remove all horseshoe nails. 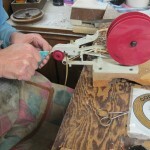 Then he patiently created a bead of solder along the length of every “seam.” The solder bead strengthens the construction, ensuring that the copper will not tear and the glass pieces will not pull apart. What was Mary Ann doing in the meantime? I photographed progress and shared pictures with our customer. Once in awhile I shared an opinion, but only when Jay asked for it. 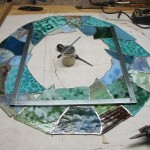 After one mirror was soldered, Jay repeated the process to fabricate a second mirror. 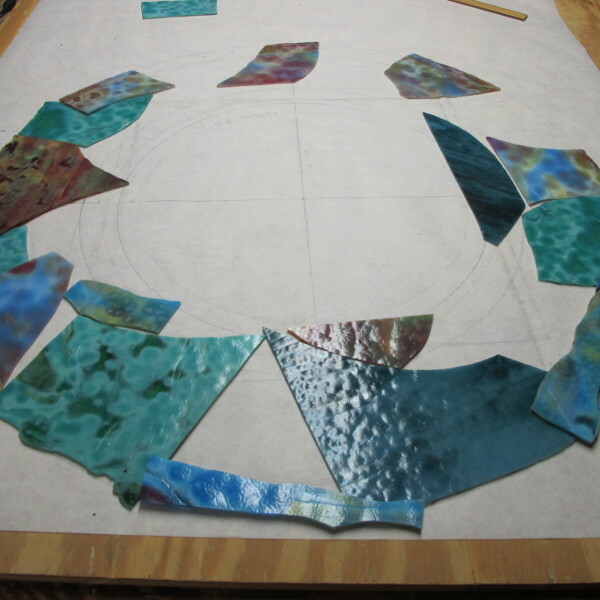 He used the same playing-with-the-glass method to choose and cut glass and made no attempt to duplicate the first mirror. 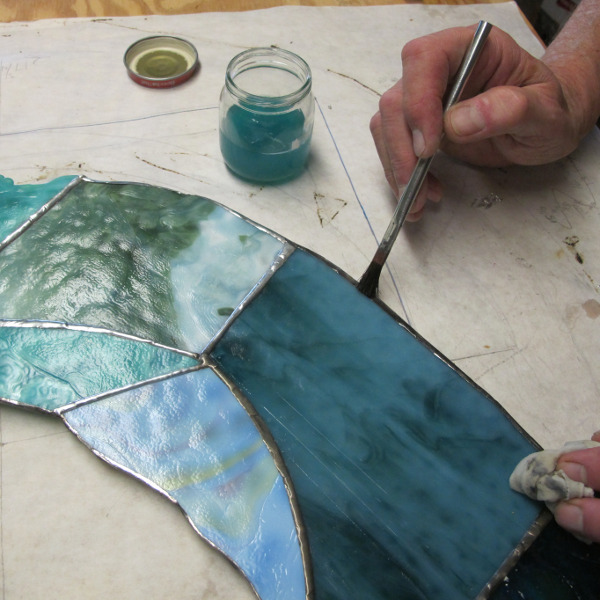 After the second mirror was soldered, he made a frame to hold mirror glass on the back of each stained glass border. 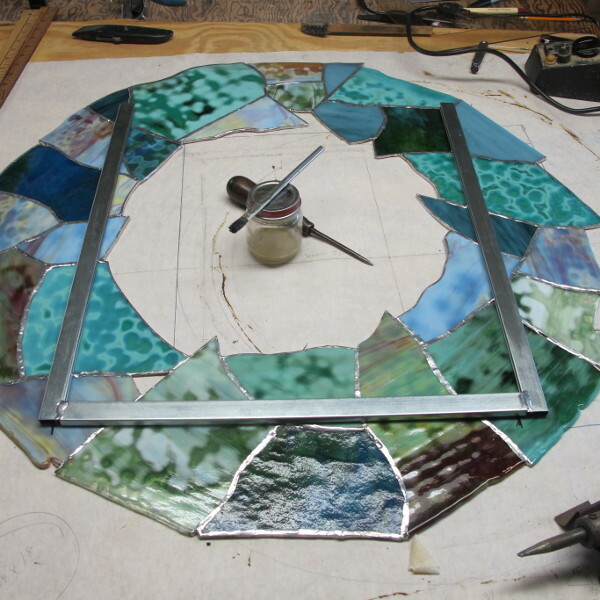 He cut three pieces of zinc channel and soldered them at the mitered corners into a U, then soldered the zinc frame to the stained glass border at strategic points where the zinc crossed the solder bead lines. If 60/40 solder is left untreated, it will gradually turn from shiny silver to a dull gray. Most customers prefer that we apply a chemical patina and Jay decided a copper patina would complement the glass colors in this project. 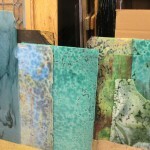 He chose a chemical mix of copper sulfate, nitric acid, and selenium compounds that reacts with the metals in the solder to yield a permanent coppery look. He brushed the chemical solution onto all solder that would be visible when the mirrors hang on a wall. Just a few steps remained. Jay inserted mirror glass into the zinc frames and threaded picture wire into small holes he had drilled on the upper ends of the zinc, by which to hang the finished pieces. Finally he signed each mirror “Paulukonis Studio (copyright) 2016.” The “Lakeside Mirrors” were ready for delivery to a lake shore home in northern New Jersey.